Looking after your skin is a bit like looking after your teeth. While you may brush and floss regularly, you still need to see the dentist for a deep clean and check-up. At Nirvana Beauty Laser Clinics we have many different facials that will give your skin a deep clean and bring your skin back to health. Toss out skin care products that are more than a year old, as these tend to become ineffective. Also, update your skin care regimen because what might have worked 5 to 10 years ago may not be optimal now. Consult our experienced and professional therapists about your skincare concerns and for advice on choosing the bestproducts for your individual skincare needs. This will allow you to understand your skin a little better so that you can look after it with the right products in between facials. Don’t forget that using the right homecare products after laser hair removal is also very important for your skin. FABUFEEL’s Laser Rescue is designed to promote skin healing, scar prevention, and cool and sooth areas post laser. Let’s be honest… while we all love the holiday season, nothing gets us more pumped than those much-anticipated post-Christmas sales. Use this time to prepay all of your laser hair removal appointments, your facials as well as your cosmetic injections and to stock up on your beauty must-haves. This will not only save you time, allow you to get organised and stay on top of your beauty routine but will be very kind to your pocket also. 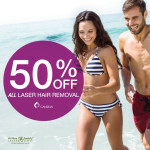 At Nirvana Beauty Laser Clinics we want you to put yourself first and to help you start the new year on the right foot we have 50% off all skin treatments and 50% off laser hair removal.